Visnic speaking at 2004 Wards 10 Best Engines celebration. This is the first in a series of guest articles celebrating 25 years of Wards 10 Best Engines. Being part of the 10 Best Engines for the first dozen or so years of its current quarter-century run, I can’t name from memory every winning engine. But I can call out those from the “early years” that were particularly special to me. Year 1 (1995): Mazda’s Miller-cycle V-6 and Nissan’s “VQ” V-6. These two pioneering engines – and the fact they launched in the U.S. market in the same model year – were the inspiration for the 10 Best Engines concept. For the VQ, Nissan dropped more than 100 lbs. (45 kg) from the same-size V-6 that preceded it. One-hundred pounds! No wonder the VQ, without variable valve timing of any kind, revved like a motorcycle piloted by a hyena. The implausibly small Mazda engine was just plain radical: Miller-cycle valving (what the hell is that?)! Lysholm-style supercharging – for a luxury sedan! And 210 horses from 2.3L. Whaaat? And the similarly small 2.3L 4-cyl. from Saab also made an indelible impression 25 years ago. Saab had it so right, with its “light-pressure” turbocharger giving a brief but useful torque-shove when needed, quickly and without the dreaded lag that came with the wide-mouth turbos of the day. Most have forgotten that oddball Saab was preaching the concept of engine downsizing two decades before it became fashionable. Problem is, VW’s vaunted diesels also turned out to be the future of squalid corporate scandals. Year 6 (2000): For a decade, Honda wrote the book on one of the most impactful enhancement technologies of the modern engine-development era: variable valve timing. Although Honda produced a dizzying variety of Variable valve Timing and lift Electronic Control (VTEC) systems, probably none was more memorable than the hypersonic VTEC introduced for the 2.0L 4-cyl. in the S2000 roadster. The dynamite-fuse F20C engine redlined at a demonic 8,900 rpm and spun up 240 hp, which Honda claimed at the time to be the highest specific output of any normally aspirated production engine in the world. Year 8 (2002): General Motors launched an all-new modular inline engine program with a 4.2L gem that was a virtually unanimous 10 BE winner. The thrusty and BMW-smooth Vortec 4200 looked to be a game-changer, but clever and unassuming chief engineer Ron Kociba’s engine program didn’t seem to align with GM’s vehicle-development cadence: the inline-6 (and 4- and 5-cyl. variants) never found application beyond GM’s coarse midsize SUVs and pickups. Somebody might someday tell the story of the forces that conspired to assure the inline Vortec would become one of the most underappreciated engine designs to come out of Detroit. I currently own a vehicle powered by a 10 Best Engine and I’ll probably never own another vehicle (unless it’s vintage) that doesn’t have 10 Best power. Sometime before the 50th anniversary of the 10 BE awards, maybe I’ll have an opportunity to tell you about the best engine – all factors considered – of all time. Here’s a hint: you can buy it, showroom-new, right now. Until then, to the engineers and myriad others responsible for a quarter-century of standout engines: Thanks for the education. Thanks for the arguments. Thanks for the memories. But mostly, thanks for the engines. 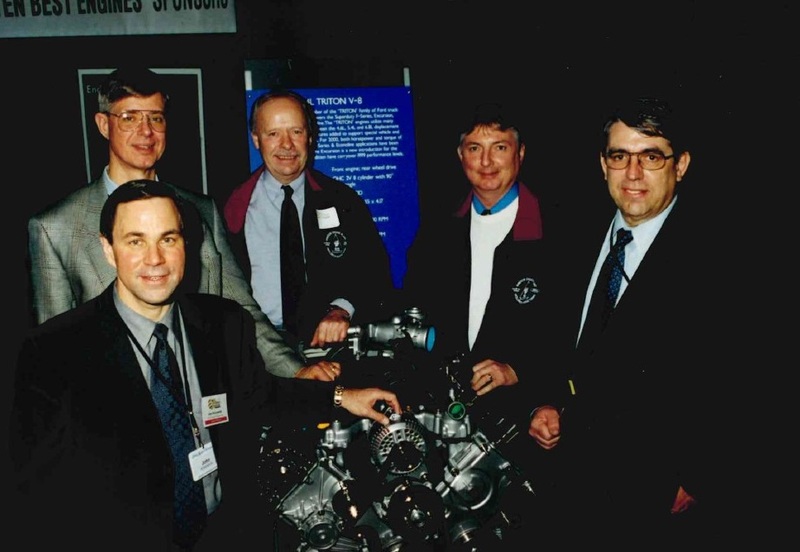 Ford engineers gather around 5.4L Triton V-8, which won six 10 Best Engines trophies in a row beginning in 1997.